Concentrations of mercury in ivory gull feathers increased nearly 50-fold in 130 years. Rising exposure to mercury could be the cause of rapid declines in Arctic bird populations, particularly ivory gulls, according to new research. Ivory gull populations have fallen by more than 80 per cent in Canada since the 1980s, leaving just 400-500 breeding pairs. However, the reasons for this are not well understood. Biologists from Canada's University of Saskatchewan aimed to find out whether contaminants are to blame by analysing the burden of methyl mercury in feathers over the past 130 years. Using feathers from museum specimens spanning 1877-2007, researchers found concentrations of mercury had increased nearly 50-fold, despite no evidence of dietary change during this period. 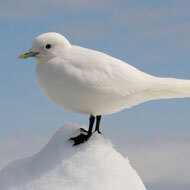 Writing in the Proceedings of the Royal Society of London B- Biological Sciences, the authors say: "Methyl mercury (MeHG) in ivory gull feathers increased significantly over the past 130 years, despite the lack of evidence of a shift in diet. "We attribute this increase to increases in the amount of mercury (HG) in the environment that has been observed post-industrially and attributed to human activity." With oceanic mercury expected to rise four-fold between 2005-2050, the findings have prompted concerns about continued dramatic declines in ivory gull populations, as well as other high-latitude species.